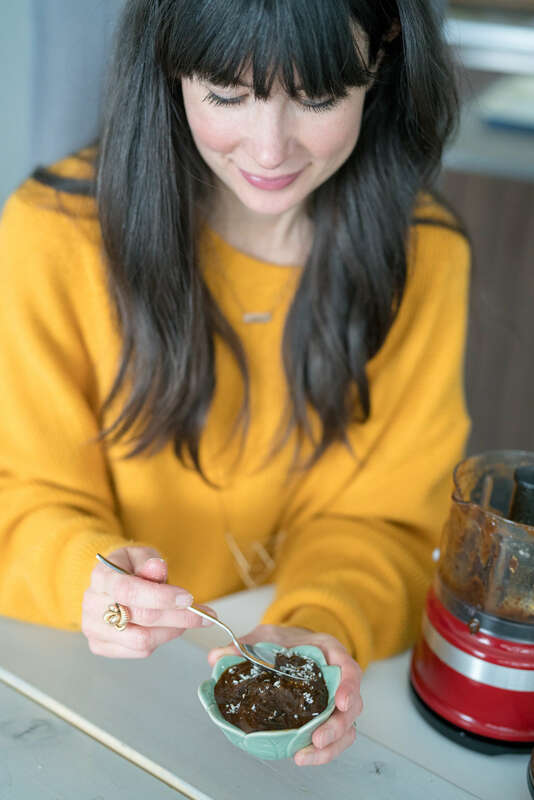 When I was a kid, my mom used to make prune whip for a treat or as a natural solution to relieve constipation whenever my brother and I were a little "backed up", but secretly, I LOVED it! I make it now that I'm a mama too! Recently, Vienna had a 24-hour stomach flu and then she got constipated from being a little dehydrated. I made this for her and BOOM - happy pooping ensued, ha! This is a safe and natural alternative to laxatives and stool softeners which I do not recommend as your digestive system can become reliant on them to function. I have serious concerns about ingredients in some laxatives such as aluminum and petrochemical based dyes like FD&C Blue. Of course, manufacturers of these laxatives never intended for people to be using them daily, but that's exactly what happens to many people. 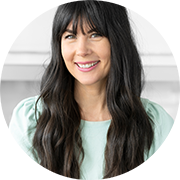 You can read a more in-depth review on laxatives that my good friend Meghan did on her blog. 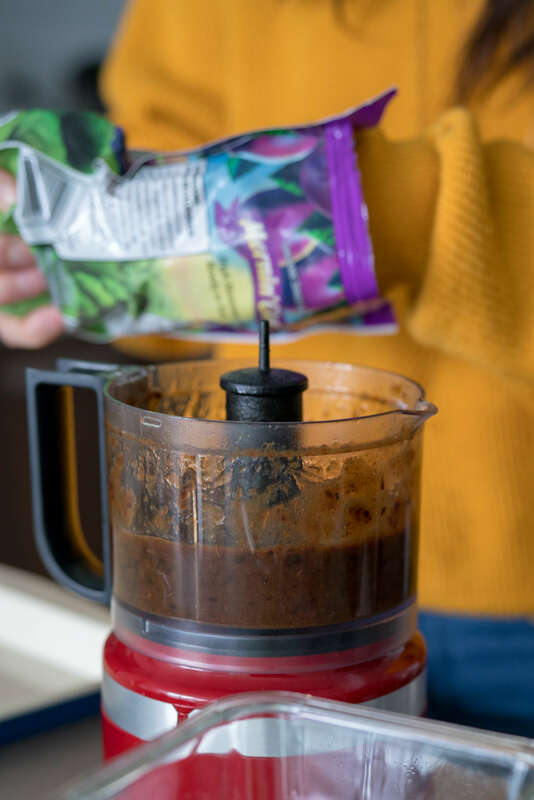 This prune whip isn't just for happy pooping though– it actually tastes really good! Seriously, what's not to like? It's sweet, pudding-like and makes a wonderful topping for yogurt or you can enjoy it just on its own. 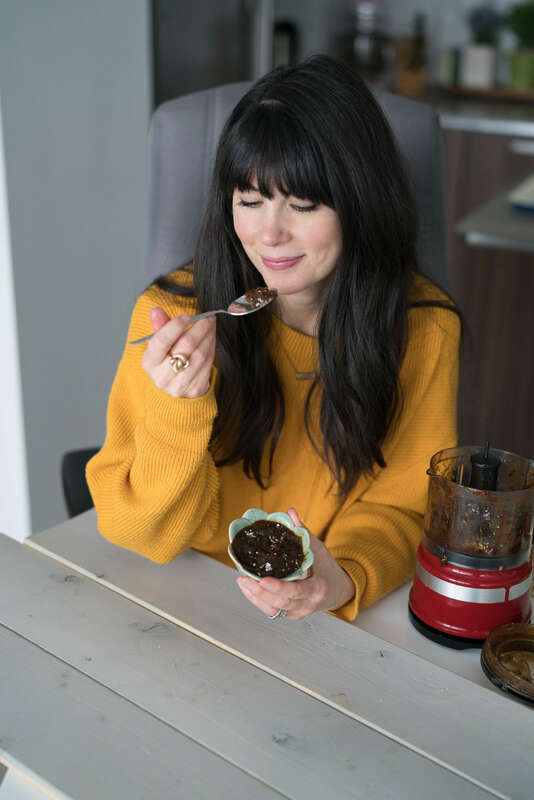 Walker got a little snap-happy with these photos and I have waaaaay too many photos of me smiling and eating this prune pudding haha! I feel like this photo above could be a funny meme. Like.... "Hmmmm, you're gonna go down and come out the other end exactly how you look right now". Okay, was that too much? I like to mix it with coconut yogurt, granola and garnish it with coconut flakes or just keep it simple and sprinkle it with coconut flakes. Make sure you buy really good quality prunes. I love these California prunes by Mornin' Glory. They are soft and always fresh. Once you soak them, they will get nice and plump so even if you're using prunes that are much more dry, that's okay. Like many recipes on Joyous Health, this one is easy peasy. 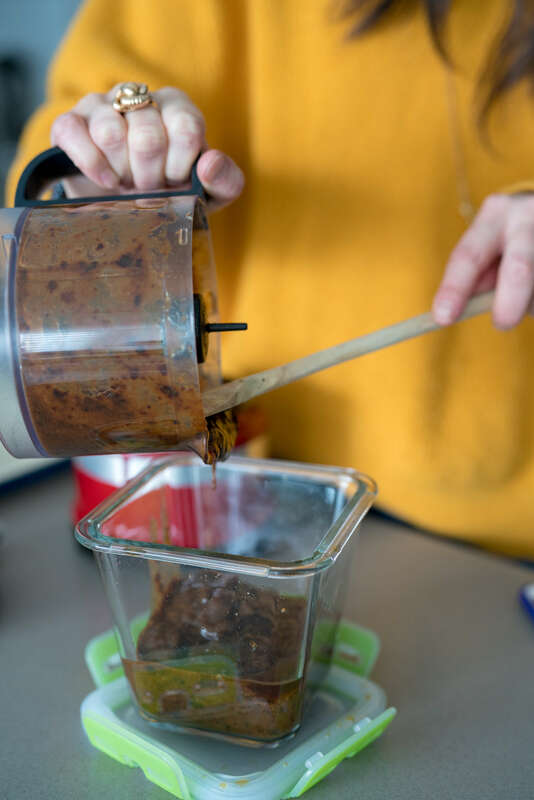 Only two ingredients (prunes and water!) because they are just so tasty on their own. Here's the recipe for Prune Whip for Joyous Pooping! 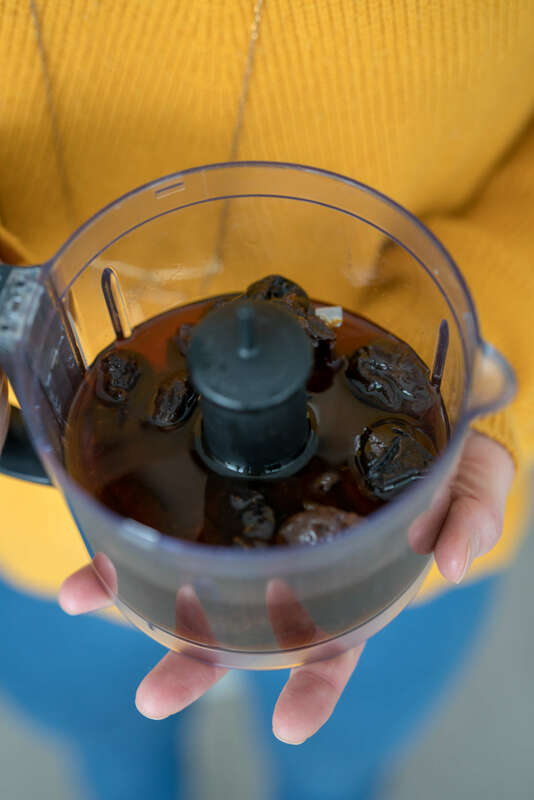 Place prunes in a medium size bowl and cover with water, just enough that all the prunes are submerged. Let sit and soak for 4 hours. Do not discard the water. After soaking, toss prunes and water in a blender or food processor and whip em! Whip em' good! Once you have the desired consistency you like, (pudding or whip), enjoy immediately or refrigerate for up to 5 days. Garnish with coconut flakes just before serving. Mmmmm, I love this recipe and so does my daughter Vienna. If you've got constipation issues, I've got many articles on Joyous Health to help you poop joyously. Give them a read! 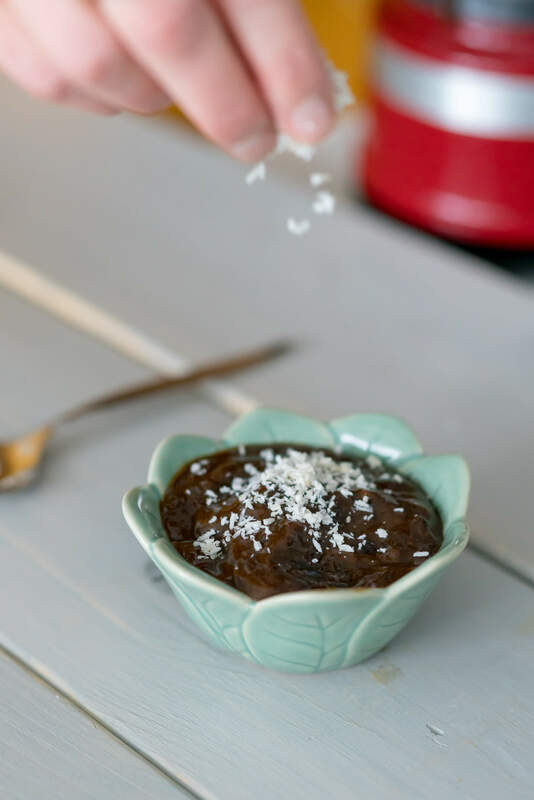 Even if you're not constipated, you don't need an excuse to eat this prune whip, it will help keep your digestive system healthy along with my other suggestions in those links above. I use to make this same recipe in the kitchen of a nursing home I was a cook at... way better than pills or powders...I now have a grand-daughter who could benefit with this recipe. Thanks for the idea again. Also, taking care of a 93 year old sweetie who takes powder and sometimes still has difficulty. It makes her miserable. Enough...I am an LPN (RPN in Ontario) and talk about the nasty TOO much I am told. OMG! I made this yesterday. I didn't want to wait so long to soak them so I poured boiled water over it and I added 4 tbsp of cocoa to give it a chocolatey flavour and it was amazing! Wish I knew about this sooner, even my five year old loved it and he has mild bowel problems WIN! Hi thanks for the recipe. Would eating just the prune itself be as effective as pureeing it? The Mornin Glory doesn't ship to Canada, I was wondering where you get yours in Toronto. I have checked health stores but I have a hard time finding organic prunes. Hi Vaishali, that really depends how much fiber your child is already eating. If they don't eat much fiber then start with a very small amount, about 1 prune worth (maybe about a tbsp) and then increase from there. Prunes are very fiber rich and this can definitely get things churning in the digestive system, so you'll wan to be careful.